Originally the service access trail for the old Cairns Regional Electricity Board (CREB), the CREB Track is one of the country’s most challenging four-wheel-drive adventures, traversing spectacular World Heritage-listed rainforest as it weaves its way north from Daintree village to the Aboriginal community of Wujal Wujal and on to Cooktown. But take note: this is a rough and ready track, suitable for experienced 4WD drivers only. A speed of between 15 and 20kmh is advised. You will also need to check that the road is open here. After spending the night in the charming artsy village of Daintree, it’s time to load up the four-wheel-drive with supplies and head out of town on Upper Daintree Road until you see the CREB Track sign. Make sure you take advantage of your first photo opportunity standing in front of the CREB map. Soon enough, you’ll be crossing the Daintree River before emerging onto a narrow, sandy track framed by wide, open fields. The red-clay track gets trickier as it ventures into thick, verdant rainforest. There are quite a few creek crossings in the middle part of the track – don’t miss the opportunity for a freshwater swim. Roughly half-way, the steep “Big Red” hill offers phenomenal views from its lookout. 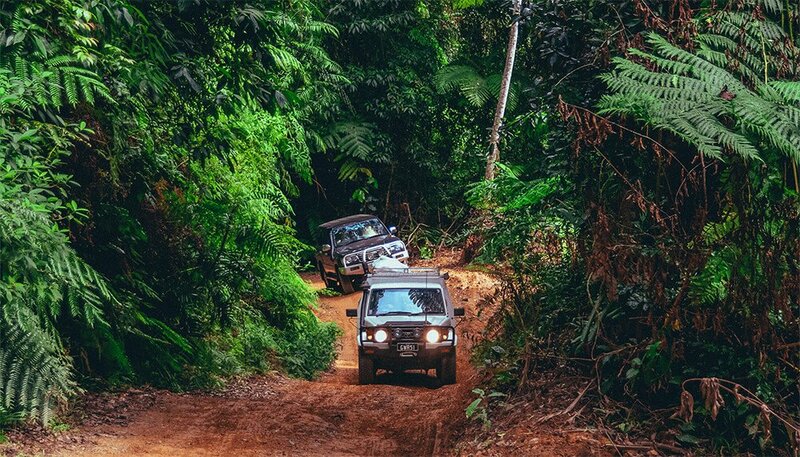 Hop out of your 4WD and stretch your legs, taking in the panoramas of the surrounding rainforest.This is one of the most challenging points of the track and should be tackled with extreme caution – there’s a bypass trail around it if you’re unsure. When you reach the bottom, you may understand why early European explorer Frank Hann reported to be thankful to have “landed safely on to the low lands”. The track then branches off to China Camp – a tin mining zone in the late 1890s – where you should see the signs to Roaring Meg Falls, arguably CREB Track’s biggest attraction. Here, you’ll see crystal water cascading over wide, smooth rock shoulders. This is an important cultural site to the Eastern Kuku Yalanji (Buru) people – visitors are requested to obtain a permit from a representative of the Burungu Aboriginal Corporation beforehand and to not take any photos or video. The top of the falls are designated as a women’s site and camping is not allowed in the area, but there’s a beautiful sandy spot at the base of the falls with clear, clean swimming water. This is the perfect place to sit and enjoy a picnic lunch. Contact the Burungu Aboriginal Corporation on 07 4098 6248 or 07 4060 3132 to gain a permit. For the last 15km or so, the track is gravel and winds through rainforest to Wujal Wujal, where it joins back to Cape Tribulation Road. Celebrate your adventure at the Lions Den Hotel before completing the last 30km leg to Cooktown. You can stay at the Lions Den Hotel – there’s camping, cabins and tents – or spend the night in Cooktown. If you opt for the latter, try the heritage Hillcrest Guest House. If the CREB Track is closed, detour down the Bloomfield Track instead. This is a wider, gravel track – but it still gets very steep in places and can be especially challenging in wet weather. About 10km south of Daintree Village, you’ll cross the Daintree River on the ferry before winding your way up through mountain ranges and down past spectacular beaches. You’ll end up on the same road at Wujal Wujal, where you can visit the falls before continuing to Cooktown.